The most common ski injuries are to the knee, thumb, shoulder and head. Injuries occur more often in inexperienced or older people but they can also happen to experienced skiers. Adequate preparation, attention to technique, risks and safety, and well-fitted ski gear can reduce your risk for injury. The medial collateral ligament (MCL) is one of four ligaments that stabilize the knee joint. Other ligament injuries can accompany an MCL injury. When the knee twists or shifts to the side relative to your thigh while you are falling or changing body position. While holding a snowplow position (crossed skis) to slow or stop with skis far apart. The knee is shifted to the side putting strain on the MCL. Management of MCL injury depends on the extent of the trauma. It is best to discontinue skiing and get off the slope as soon as possible and apply first aid measures. Minor MCL strains or sprains can be treated with the usual first aid for sports or exercise injuries: rest, ice, compression and elevation (RICE), in addition to an anti-inflammatory pain medicine such as ibuprofen. An exam will evaluate for injuries to other knee ligaments such as the ACL or fractures of the knee or leg. Initial stabilization of your knee with a brace or splint that limits the range of motion of your knee for three to six weeks. Once the knee stabilizes you can do prescribed, progressive range of motion and strengthening exercises to return your knee to full function. Less frequently, knee surgery to repair a separation of the ligament. Make sure you are in good sports condition and well-rested. Heed general ski safety advice and ski resort safety rules. Ski at your skill level. Wear the proper clothes and use equipment correctly including boots and bindings. Learn how to fall instead of resisting the fall in a way that leads to injury. Injury to the anterior cruciate ligament (ACL) can occur alone or along with other knee ligament injuries. Though less common than MCL injuries, there might be more long-term results from this injury. ACL injuries can be sprains or partial or complete tears. The "Phantom Boot" happens when the tail of the ski and the back of the hard ski boot act together as a lever against which the ACL bends and twists. The "Boot Induced ACL" occurs when the off -balance skier lands hard on the ski and the back of the boot propels the lower leg (tibia) forward in relation to the upper leg (femur). While falling backwards with the hips lower than the knees, your knee twists as it continues its forward momentum. While moving forward your lower leg suddenly twists away from your upper leg while "catching an edge" of one ski to turn or try to stop. This throws the ski and your leg outwards and the ligament sprains or tears. As for other injuries, assess your condition. If in doubt, don't resume skiing and get off the slope as soon as possible and apply first aid measures. This includes rest, ice, compression and elevation and an anti-inflammatory medicine such as ibuprofen if your injury is minor. Keep the leg straight and still to prevent further injury. Though ACL injuries are less common than MCL ones they can have more serious consequences. An ACL injury often requires surgery to repair the ligament and long rehabilitation to recover normal function of the knee. As with MCL injuries take precautions to prevent injuries or reinjury. Learn how to fall correctly so if a fall is unavoidable you can decrease your risk of injury. Injury to the ulnar collateral ligament (UCL) of the first joint of the thumb is also called "Skier's Thumb." UCL injuries commonly happen from falling with outstretched arms while still gripping the ski pole. The first joint of the thumb is pushed sideways away from the pole and the rest of your hand, stretching or tearing the UCL. Other less common injuries of the thumb include dislocations or fractures. Assessment and initial treatment of a "skier's thumb" includes standard RICE first aid measures. Further treatment requires casting the thumb for three to six weeks for moderate to severe sprains. If the ligament is completely torn from the thumb surgical repair may be needed. If the injury is not recognized and treated properly you can be left with permanent instability and disability of the thumb. Surgery is likely needed if there is a complete separation of the ligament from the thumb. In addition to learning how fall, prevention of thumb injuries includes using ski poles with straps rather than a fitted or fixed grip. Based on a 2009 British Journal of Sports Medicine review, common shoulder ski injuries are strains to the rotator cuff, a group of ligaments that stabilize the shoulder joint. Less frequently the rotator cuff, other ligaments, and other soft tissues tear and the joint is shifted (subluxation) or dislocated out of place. In addition, bones in the joint, the clavicle and the top or ball of the arm (humerus) can fracture. As for other ski injuries, you or others around you should assess your overall condition and get off the ski course as soon as you can. Rest and apply ice to your shoulder. Take an anti-inflammatory medicine for pain if the injury appears to be minor. Strains or sprains can be stabilized and protected by putting the arm in a collar. Dislocated shoulders can often be popped back into the joint socket in a doctor's office. Surgery may be needed to put the shoulder back in place, or to repair tears to ligaments or bone fractures and stabilize the joint. After treatment early physical and rehabilitative therapy will return the joint to full function and prevent loss of mobility (freezing). To prevent initial injury take general safety precautions on the ski slopes and learn how to fall and how to stop. Recurrent shoulder injuries are common so be aware of what led to the first injury. Ski-related head injuries can include scrapes, bruises, cuts and fractures. They happen from a hard fall or collision with an object or another skier while going fast. The extent of the injury depends on the speed of the skier and the object hit. You are more likely to die from a head injury than other ski injuries. 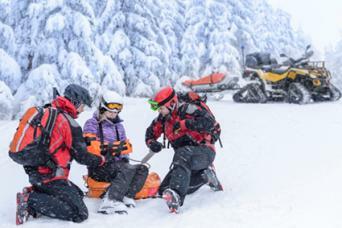 First aid and other decisions for head injuries rely on quickly assessing the skier's condition, symptoms, and the extent of the injury, which might difficult. You and others around you should be aware that the severity of a head injury can be more severe than it initially appears. Have a low threshold for seeking help, including alerting emergency medical services. Getting off the slopes might not be possible without expert help. Always consider that there is a chance of an accompanying neck injury. Any head or neck movement could cause further injury to the spinal cord. Even if the injury appears minor and there are mild or no symptoms present, anyone with a head injury should get quick medical attention. Symptoms or signs of a more severe head injury, such as dizziness, confusion, or loss of conciousness, should be regarded as an emergency and require emergency medical alert and attention. Evaluation and treatment depend on symptoms and severity of the injury. With a head injury symptoms may not come until hours later so a skier should be observed carefully for signs of a traumatic brain injury, preferably in a hospital. Unrecognized severe trauma to the head can lead to bleeding and increased pressure on the brain, which in turn can lead to brain stem herniation and death. In addition to general ski safety rules, advocates suggest that wearing a helmet can reduce the risk of head injuries in skiing. Other prevention advice includes being aware of other skiers, ski lifts, and other resort objects, sticking to marked trails, not speeding, and skiing at your skill level. Exercise and condition the muscles you will mostly use while skiing before the season starts. Check ski equipment, boots and ski bindings. Make sure your bindings are tested and adjusted according to the American Society for Testing Materials (ASTM). Make sure you adjust ski bindings for your height and weight. Ensure you are getting adequate rest. Watch your diet and fluid intake. Wear layers of clothes you can adjust and don't hinder your stability or movement. Keep general skiing and ski resort safety in mind. Be mindful of trail conditions such as rocks and ice as well as weather warnings. Inadequate preparation, too much speed, fatigue, over confidence, and inattention to safety and risks can lead to serious injuries. Preparation and safety measures can help to reduce your risk for injury on the slopes.